To draw customers to their brick-and-mortar locations, many retailers are turning to new technology such as beacons to enhance the in-store experience. Beacons, which will be featured at this year’s National Retail Federation Retail’s BIG Show 2017, are tiny, low-energy devices that use Bluetooth technology to send out personalized content to consumers’ mobile devices as they shop. Last year, Business Insider estimated that beacons would help generate some $40 billion in retail sales in 2016, and that figure is expected to grow. 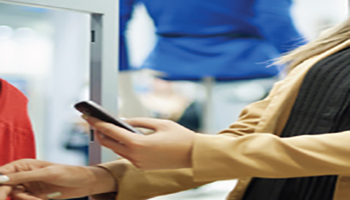 By connecting beacons to digital signage, retailers can provide customers with new product information and downloadable vouchers. Several big-name retailers have found success with beacon deployments. MobileBridge reports that Lord & Taylor saw a 60 percent engagement rate with customers as a result of the beacon technology they installed in one of their Boston locations. According to a Beaconstac blog, other prominent retailers venturing into the world of beacons include Oscar Mayer, Target and Macy’s, which is expanding beacon technology to all of its stores, for a total of 4,000 beacons, after successful test-marketing in some large markets. All the above brands are taking advantage of the propensity of consumers to use their smartphones and wearable technology while shopping. According to Marketing Land, a 2015 survey by mobile loyalty company SessionM reported that 90 percent of consumers consult their smartphones while they’re in physical stores, using them to download coupons; look for competitive pricing; find product specs, warranty information and other product details; and even pay for their purchases where available. Here’s a more detailed look at how technology is helping to shape the retail store of the future. Millennials are driving retail trends. Download the eBook for a free guide on how to adapt your retail strategy for this generation. Although some mobile payment options are limited by the retailer’s chosen point-of-sale (POS) technology, Samsung Pay enables consumers to connect with POS terminals using magnetic secure transmission (MST) and NFC card-reader technologies. A recent feature of this service also dovetails nicely with beacon technology, using location-based services and insights from Samsung Pay data to deliver targeted, personalized messaging to a customer’s smartphone. This data provides them with a more personalized shopping experience because it uses state-of-the art analytics and insights based on their previous shopping behavior to provide them with the offers most likely to trigger additional purchases. In addition to the benefits of digital coupons, product information and proximity-based offers that beacons provide to consumers to enhance their in-store experience, they also provide retailers with important consumer intelligence, such as how long they stopped at beacon-enabled displays, the relationship between beacon-enabled sales offers and actual sales, and similar information that can be analyzed to adjust offers as well as staffing and placement of sales associates. These insights will enable retailers to drive better revenue and profits from brick-and-mortar locations. When retailers use innovative technology such as beacons to find new ways to engage with their customers, they’re creating personalized shopping experiences that draw in new consumers and give loyal shoppers a reason to keep coming back. Getting the most out of beacons requires implementing a clear omnichannel strategy. Here’s how to ensure a successful beacon adoption in your store.